Saturday brought the long looked for break in the ski conditions thus far this year: It finally started to warm up to the mid-teens, and there was enough (I hoped!) snow to do my first backcountry skiing of the year. I knew the cover would be a little on the thin side (That always seems to be the case, somehow), so I headed to the higher elevations and a place where there was a high likelihood of being ample cover. 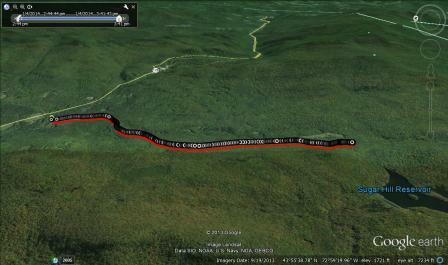 Once again, I found myself drawn to my favorite trailhead, the parking lot off of Brooks road, found on the south side of Rt 125, midway between Breadloaf and the Snow Bowl. 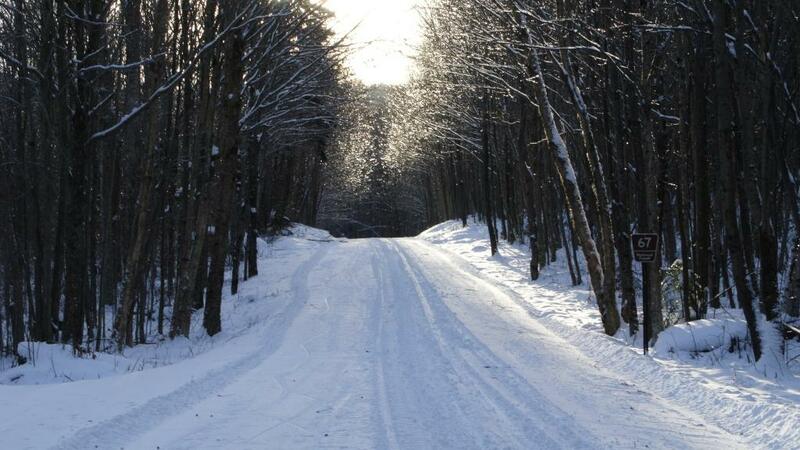 The Brooks Road itself, which climbs up the hillside to pretty high altitudes becomes part of the VAST (Vermont Association of Snow Travelers) trail system during the winter. As such, it benefits from the regular grooming offered to regional snowmobilers, making the VAST trails also ideal for skiing deep into the mountains, even on skating skis, which demand a wide groomed path. This excellent grooming makes high altitude forest roads, like the Brooks Road, some of the best places to ski early in the season before the first dumpings of snow come our way. Setting off from the parking lot up the hillside, the late afternoon sun filtered through the branches arched over the road created the sense of trees covered with diamonds. I was surprised by the degree to which some of these trees were still encrusted with ice from the storms of the previous week or two. 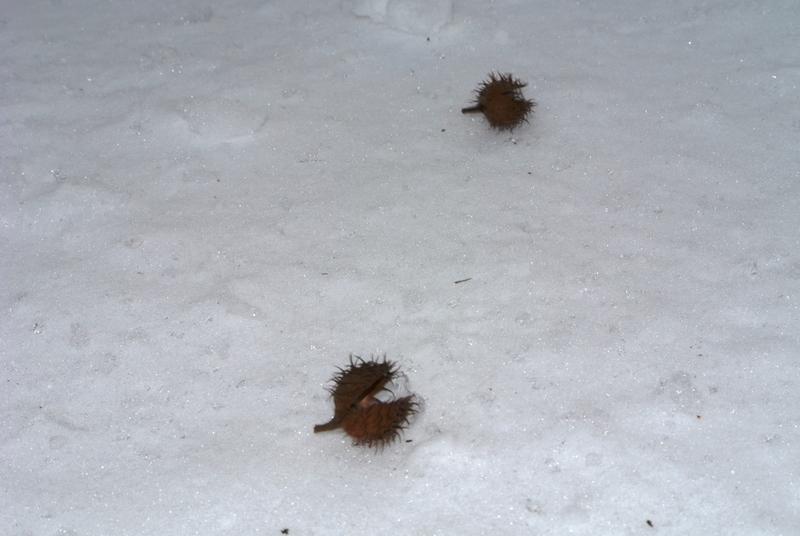 Continuing upward I also came to a section where a stand of beech trees s flanked the road, the the husks of beechnut shells littered the snow. Looking at them more carefully, they kind of looked like a bunch of bearded little Pac-men. What do you think? I went into this ski with delusions of a long a glorious exploration of mountain trails, but my late start (It is scary how starting a ski tour at 2:30 in the afternoon is late this time of year!) and the realization that the trail coverage wasn’t quite as good as I hoped it was forced me to reconsider my plans when I reached a trail confluence about 2.5 miles up the mountainside. To the right, I saw the much narrower trail which I knew would bring me to the Sugar Hill Reservoir, but looked rather bereft of snow. Straight ahead, on the continuance of the Brooks Road, but on a section which is not regularly maintained for winter travel there was more snow, but since I was touring on skating skis, this section’s loose ungroomed snow felt like a bit of a slog when I very briefly considered continuing further. And it was getting colder, fast! So, at this point, I turned my heels and sped back down the mountainside to the warmth of my car. Of course, in this fast snow it provided an opportunity to use my Garmin GPS and see what sort of speed I could generate on the two relatively steep descents. On the first steeper drop-off I became so enamored of staring at my watch that I had my first crashandburn of the season! Only slightly less worse for the wear, and covered in white I brought myself back up to speed and held a tuck without distraction for the second, and longer fast section of the descent, and after finishing discovered that I had gotten my speed up to 25 mph! Not exactly olympic downhill speed, but not bad for inch-wide racing skis with detached heels! Up to this point, the post has had little to do with the title of the post, so I guess it would be time to conclude with a resolution. These solo skis or runs in the mountains leave plenty of time for quiet, introspective thought. Readers of this blog can probably tell that I enjoy setting myself up for personal physical challenges, and then meeting those challenges, but this resolution is a little different. While the personal accomplishments will hopefully continue, what I really want this year is to make great new memories with those who I care most about.